Guessing Gorkamorka didn't turn out so well? Another idea to throw into the hat would be a new Space Crusade. Edited by Serrano, 24 August 2013 - 11:05 AM. If it's faithful to the original without any crap tacked onto it, I'll buy it. Hey, I remember it, and I haven't even played it! Now here's a man thinking with his imagination. 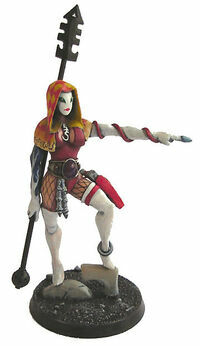 Much as I hate to admit it, console gamers would wet themselves if you could get the fluidity of the eldar into a game. Could happen some day, Space Marine rocked socks. It's a unique game, certainly. Nothing comes close to forcing [me] to play without fear, like that game. If you are afraid you will die. If you are pure righteous fury then you are fine. 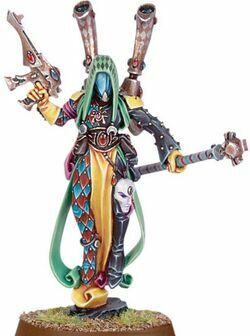 Well on the one hand, even if the Grey Knights are rank amateurs compared to the Harlequins, Harlequins do lack the iconic nature of Space Marines, and space elf ninja clowns, no matter how badass they are with all their colour, finesse, and the most nightmarish weaponry in the 40K lore, may not be as appealing in an age of Gears of War and would only appeal to 40K fans who walk the walk and talk the talk. On the other hand, Fire Warriors wouldn't have been my first choice for the subject of the first major mainstream action game based upon the franchise. Enjoying Space Hulk so far, thank you for the review Walsingham. Wasn't Fire Warrior that infinitely boring, linear corridor shooter featuring Tau, released a long time ago? I remember trying it for 20 minutes on a console. Then had to stifle a yawn and do something else to wake up again. My dream of a great character action game where you played as a Harlequin Solitaire unfortunately died when Itagaki left THQ shortly before the company folded. That said, that part of me that loves Armoured Core, Shogo: Mobile Armour Divsion, and Heavy Gear actually thinks the Tau and their Crisis suits are pretty damn cool. Edited by Agiel, 25 August 2013 - 06:07 PM. I guess I'm going to reveal myself to you all as a robot now, but I actually played through that game. It's competing with Lionheart for being the world's most awful game you still want to play. On the other hand, Lionheart starts out OK and devolves into an endless trudge through ****, Fire Warrior starts out as **** and gets more interesting later on. You speak of heresy, xeno-lover. In no way can foul, fallen xenos compare to the glory and perfection of the Emperors Chosen! Edited by TrashMan, 28 August 2013 - 01:46 AM. To be fair, I'd argue most fashionable youngsters I see in the street look like they came from a children's birthday party. I wonder what the chances of something like Chaos Gate are now that x-com has done so well. Edited by Serrano, 28 August 2013 - 09:59 AM. Still hoping for it to come to GoG.